What Would You Like JDIO To Do For You? Know where your project financially stands at any time, both from a broad overview perspective and down to the details of a check. Knowing where the progress of a construction project stands is critical. Having this information available to Project Stakeholders can be invaluable. 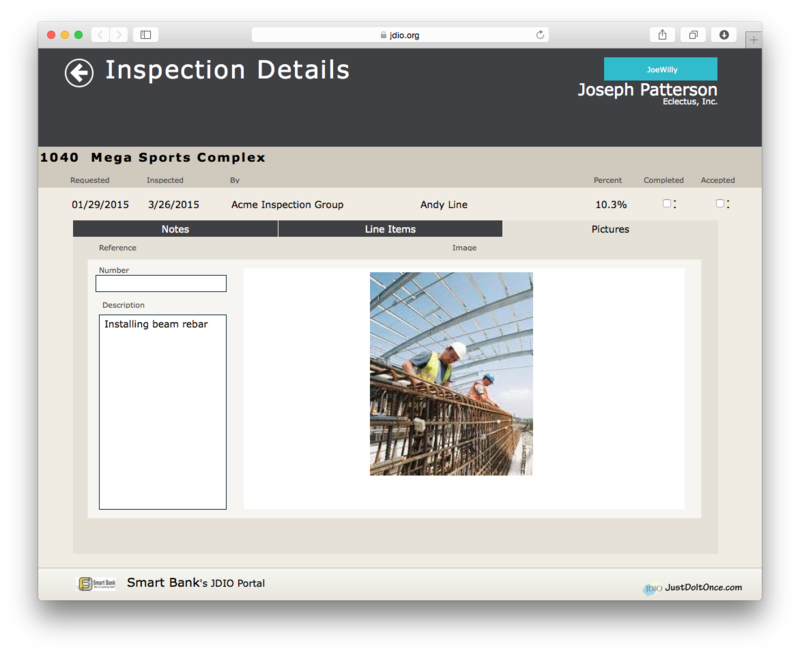 Inspectors can update this information in JDIO with photos, notes, documents, and images. All too often payments are delayed because of missing information, or, worse yet, lack of communication as to what is really needed. The JDIO payment request process helps eliminate these stumbling blocks to make the payment process as seamless and easy as possible. You identify what it is that you want and let the JDIO validate that you will be getting what you need. JDIO knows construction! This requires a mastery of many types of details from building codes to financing requirements—especially those requirements set by government agencies. There are many specialized processes that JDIO supports that meet specific industry needs. One in particular is FHA's 203k loans. We support the collaboration between the borrower, the contractor, and the HUD authorized inspector so that draw requests can be streamlined and issues resolved even before paperwork is ever submitted. We’re so in tune with this process we even produce the required forms. If there is one certainty about construction it is that it changes. Owners may change their minds about the plan, government agencies might decide they want something different, or architects and engineers could find a structural change that needs to be made. JDIO allows for the inevitable changes with capabilities to request and track budget and/or contracts changes.